It’s funny, isn’t it, how it is easy to regard a sibling as the ‘favourite’ of our parents. Over the course of many years, one can misread the actions or words of our parents as suggestive that a brother or sister is more important to them than we are. Our mind can make personal slights out of comments that were never intended as such. We tell ourselves that this is irrational behaviour, yet it persists, even when we should know better. Of course, the reality is that our siblings may well think the same way! Pretty much as soon as we meet Joseph in the Old Testament, we see that he has a rather difficult relationship with his siblings. 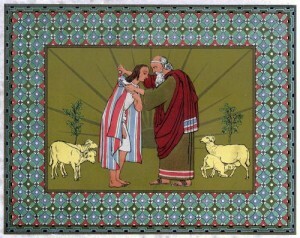 They feel that he is their father’s favourite; Genesis tells us that Joseph’s “brothers saw that their father loved him more than any of them.” Far from being irrational on their part, however, they were spot on; Genesis states that “Israel [Jacob] loved Joseph more than any of his other sons.” To make it abundantly clear, Jacob made Joseph “an ornate robe” – the so-called “coat of many colours” that most of us probably sang about in primary school. Is it really Joseph who should feel the brunt of his brother’s anger and hatred, however? He couldn’t help being born to his father when Jacob was old. He didn’t choose to be given a coat by his father. Whilst his brother’s anger is rational, it is probably misdirected; they would have been better directing it at their father. Joseph’s brother’s anger got the better of them and they ended up plotting to kill their brother before selling him into slavery. Joseph, who had not courted the favouritism of his father, ended up suffering as a result of it. There is much than we can learn about our attitude towards others from these few short verses. Firstly, if we find ourselves in a position of care over others, perhaps our own children or groups that we work with, we must be conscious of being perceived to have ‘favourites’. The story of Joseph shows that favouritism can cause great problems and have ramifications that are far from desirable. Secondly, we must be careful not to misdirect our anger towards others who can not help the position they find themselves in, whether they be our siblings, those born to rich parents, those who we encounter begging in the streets. It is easy to get angry but much of the time our anger is unjustified. Thirdly, we must ensure that we do not let our anger get the better of us. Jacob’s sons’ anger led them to a pretty bleak place, their plot to kill Joseph, and whilst we are unlikely to find ourselves plotting to murder our siblings, anger has the potential to lead us into situations and circumstances that are best avoided. Of course, ultimately, as we shall see, God worked through the anger of Joseph’s brothers. Perhaps the best situation at the time, however, would have been for the brothers to rise above their father’s blatant favouritism, and to strive to love Joseph. In our own lives this will inevitably be the best option. We must ensure that we don’t allow anger and hatred to contaminate our own lives, but strive to love instead, even those whom we feel have aggrieved us.